For the first post of this website, I thought I would make something that I am familiar in making. It may seem like a hard and long process, but I assure you that this dish will be your famous go to food when you get invited to a potluck or host a party. Be prepared to get asked about the ingredients and the process of making the lasagna…CAUSE IT’S REALLY SIMPLE. First off, I modified the recipe, several times, leaving some ingredients out or skipping some steps. This is common (when I am cooking) because I AM LAZY! One way that you could please both sides can be to split the cheese in half. 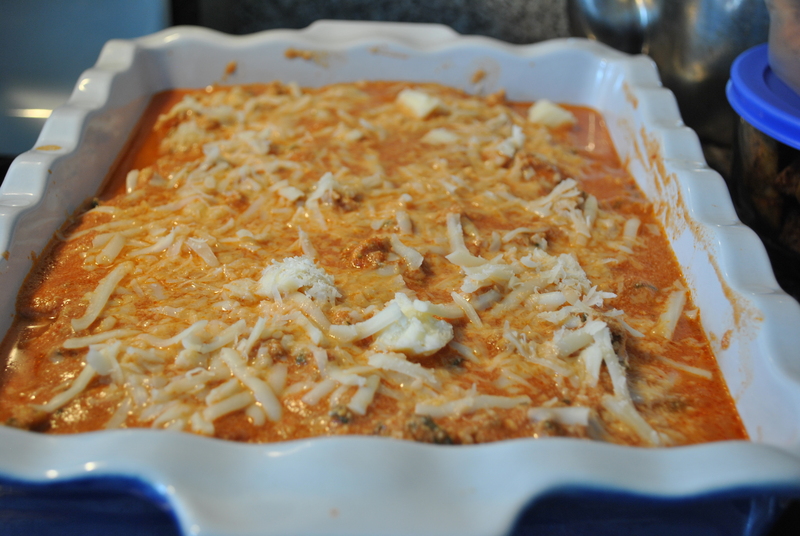 For the people that like their lasagna to be cheesy, just add more cheese to one side of the cooking dish. Or lessen the amount of cheese on half of the cooking dish. I purchase my meat ungrounded. If I’m feeling lazy (in most cases), I will put the meat and parsley in a food processor and chop them till they are in small bits (saves me time compared to grinding the meat with a Kitchen Aid). If you are worried about the seasoning of the lasagna, skip putting in the parmesan into the sauce. I find that some parmesan cheese can be more saltier than others. This is my favourite brand of tomato sauce to cook with. Finished product ready to put foil and place in the oven. After an hour and 15 minutes, it’s ready to eat!